November 30: Foghat, "Slow Ride"
While one can make the case that one of the greatest achievements an artist can reach is to create a truly original sound that stands in defiance to everything being created around them, there is also something to be said for perfecting a mainstream sound. The reality is, there is almost always a reason why a certain sound catches on, and there are usually a handful of artists that deploy this style with a power and mood that is far beyond a majority of their peers. In fact, one can find a number of instances where even when the music in question was nothing stunning, due to the time during which the song was released, as well as the overall spirit of the performance, it still manage to reach an iconic status. Though there are a number of bands that fit this description, few do so as perfectly as one finds within the catalog of the 1970's blues-rock band, Foghat. Bringing a harder edge to the blues-based rock and roll sound that had been developing for a few years, Foghat possesses a tone that cannot be mistaken, and it is also their rather unsubtle lyrics which quickly endeared them to fans. Even nearly three decades after the release of their most commercially successful recordings, the reality remains that their songs are still just as good today as they were then, and there may be no more essential a blues-rock recording than what one can hear on Foghat's classic 1975 single, "Slow Ride." Truth be told, there are few song openings from any point in history that can rival that of "Slow Ride," as the stomp which quickly gives way to the guitar riff is one of the few that never "gets old." The way that the guitars from Rod Price and Dave Peverett ring across the track instantly grabs the listener, and the slightly dirty distortion perfectly fits the overall mood of the song. It is within this element of the song where one can hear traces of heavy metal, as the band certainly brings a similar amount of volume. However, it is the almost "Southern" feel to the riff that sets it far apart from any other recording, and one cannot help but get caught up in the fantastic mood that the guitars create. Yet it is also the brilliant work of the rhythm section that has enabled "Slow Ride" to stand out even as the decades have passed. The bassline from Nick Jameson brings a groove and funk that has rarely been matched, and one can hear traces of this sound in a number of bands and styles that followed. There are moments where "Slow Ride" has an almost "go-go" style of swing, and this is a rare occurrence anywhere within the hard rock world. This distinctive tone is perfectly matched by the sound of drummer Roger Earl, and it is the fact that his playing is so far forward in the mix that makes "Slow Ride" a song that once heard, can never be forgotten. However, while one can argue that it is the musical arrangement which has vaulted "Slow Ride" to such a status, the vocal performance from Dave Peverett cannot be overlooked. Not only does Peverett have a vocal range that is on par with his finest peers, but the tone and style with which he sings is completely distinctive. Matching the music over which he performers to perfection, it is the high-spirited tone in his voice that helped "Slow Ride" to quickly climb the charts on both sides of the Atlantic Ocean. Whether he is keeping a more focused pace and pitch during the verses, or letting the mood of the song dictate his pace and word placement during other parts of the song, Peverett is easily as good as any other blues-rock singer of his era. Yet it is also the fact that the lyrics found on "Slow Ride" can be interpreted on a number of different levels, some suggesting rather unsubtle thoughts, which has kept the song relevant as the decades have passed. While some may say that the song is about a relaxed drive, there are many that will argue that the rather frank sexual implications that one can derive from the words are the far more obvious choice for the songs' meaning and intent. However, the fact of the matter is that due to the spirit with which these words are sung, the meaning becomes slightly second nature, and one can find similar examples of this reality all across a number of bands that followed Foghat. Though most are unaware, there are actually five different versions of Foghat's "Slow Ride" that one can easily find on various records. The original studio version clocks in at nearly nine minutes, and this take on the song is rarely heard, as it is a far cry from a length that radio stations will permit. With this in mind, the band edited the song down to just under four minutes for radio airplay, and this version of the song is certainly the most well known. Yet there are also a few live versions of "Slow Ride" that have been "officially" released, and all of these are longer than the original studio version, yet have an energy and drive that is just as enjoyable to experience. However, when one breaks the song down to its core elements, one can make the case that it is slightly more in the punk rock world than it is in the "hard rock" arena. The reality is that the song is based around a powerful three-chord progression, and many people argue that this style is the "basis" of the punk rock sound. When one adds in the overall crunch and drive that in many ways defines "Slow Ride," this idea is made even stronger, and yet most completely dismiss the track as anything more than a hard rock classic. Regardless of how one defines the song, there is no denying the fact that it has endured the decades far better than nearly any other song of the era, and there has rarely been another track that can compare to the sound and strut that one can find on Foghat's unforgettable 1975 single, "Slow Ride." Daily Guru: "Something Old, Something New #29"
November 29: The Chiffons, "One Fine Day"
Though many people may wish to group them all together under a rather strict style, the reality is that within the sub-genre of the so-called "girl groups" of the 1960's, there was as much musical diversity as one can find anywhere else. While one can argue that there is a common sound that links them all together, one can find variations across the board in terms of tempo, intent, and power, and it is these differences that make the era one of the most exciting in all of music history. Due to the fact that there were so many different approaches within a somewhat similar configuration, one can find a number of exceptional acts, and yet few delivered with the same power and style that one can find in the catalog of The Chiffons. For more than a decade, the quartet recorded some of the most beloved songs in history, and to this day, one would be hard pressed to find another act from the time period that has been covered as often as The Chiffons. Bringing a sonic confidence that was far beyond that of nearly all of their peers, it is this distinctive sound and swagger that keeps many of their songs sounding just as fresh today as they did more than four decades ago. Though the group is responsible for a handful of the most memorable songs of all time, few can compare to the sound and resonance of The Chiffons' unforgettable 1963 single, "One Fine Day." From the moment that the song begins, "One Fine Day" is an absolutely glorious celebration of life, and even after more than five decades, the energy and overall feeling of the song has yet to be matched. There is no question that this song stands as one of the finest in writing catalog of the team of Gerry Goffin and Carole King, and it is the latter's performance on the song that while often overlooked, is one of the keys to the appeal of the track. Truth be told, the piano riff played by Carole King that opens the song remains one of the most memorable in the entire history of music, and yet it is the way that her piano delivers what is almost an additional vocal line with the triplet-style fills with which she follows many of the lines. There is a strength and aggression within her playing on "One Fine Day" that is rarely found elsewhere, and it is this approach that helps to perfectly mirror the similar style found within the singing. Furthermore, the fact that her piano is so far forward in the mix is a rarity for any era of music, and even when the song seems to fall off tempo for a moment, the overall spirit is never lost. It is the way that "One Fine Day" seems to sway back and forth that is in many ways the epitome of the "1960's sound," and one can easily picture the song being played in an old soda shop or a sock hop, and yet the song still has a massive appeal within the current music scene. Yet even with this fantastic, oft-copied musical style, there is no question that the true power of "One Fine Day" lives within the vocals of The Chiffons, and even amongst the wide array of "girl groups," they stand out on their own. It is the fact that the harmonies are so tightly wound all across the sound that sets "One Fine Day" as such a high standard, and it is also the overall smoothness of the vocals that become so appealing. Though there are various lead parts, all of the voices manage to seamlessly blend together in stunning fashion, and one can easily argue that one can use "One Fine Day" as the definition of what it meant to have the "girl group" sound. It is the spirit behind their vocal performances that separate the song from the pack, and one cannot help but get caught up in this dazzling vocal display. The backing "sho-be-doo-be-doo" that is repeated throughout the song has also become one of the iconic phrases from the era, and one can see this, as well as the harmonies as the clear link between the "doo-wop" sound and the pop style of the early 1960's. The final way that "One Fine Day" separates itself from a majority of songs by "girl groups" is the fact that The Chiffons are not playing the part of the "sad victim" on the song, and they bring a confident, proud sound to every word; in many ways marking one of the first instances of female empowerment on record. As the decades have passed, "One Fine Day" has been covered countless times by artists ranging from Jackie Wilson to Natalie Merchant to Aaron Neville, and it has also been featured in well over a dozen different films. The fact that such a wide array of performers have recorded their own version of the song, as well as its consistent use within other mediums of popular culture is a testament to the overall greatness of the song, and yet none of these later versions or uses have come even remotely close to the power and presence of the original. Even when Carole King recorded her own take on the song, it was missing the swing and spirit of The Chiffons, and yet one cannot dismiss the fact that it is her piano that drives much of the original version. Furthermore, one can find influences both musically and vocally across many later artists, and it is impossible to overlook the similarities between "One Fine Day" and The Beatles', "It Won't Be Long." In fact, members of that group often stated their admiration of The Chiffons, and this is the final element one needs to solidify their place as one of the most influential groups in all of music history. Though they had a number of unforgettable hits throughout their career, there is simply no other recording of The Chiffons that has endured quite like their magnificent 1963 single, "One Fine Day." November 28: Daily Guru, "Gurucast #100"
November 27: Lou Rawls, "Your Good Thing (Is About To End)"
Song: "Your Good Thing (Is About To End)"
While there are a number of bands and musicians that have easily perfected their own style of music, it is often those elite performers that are able to excel across a wide range of genres who are held in the most highly revered status. Whether it is due to their seemingly unending talents on a specific instrument or the way that they can use their own voice, these few performers stand as true legends even as the decades pass and the trends in music change. Though he can be argued as one of the finest in the history of soul, r&b, jazz, and even pop music, the fact of the matter is that there is no way to easily define the music of Lou Rawls, and that in itself is much of the reason he stands as such a legendary figure in the history of recorded music. For more than four decades, Rawls brought some of the most raw and highly emotive sound one can find anywhere, and it is the fact that his voice and style seemed to know no boundaries that set him so far apart from his peers. Whether he was swinging a gritty tale of the streets or delivering a smooth crooning ballad, there is never any mistaking his voice or style, and his extensive catalog is filled with some of the most unforgettable songs in all of music history. 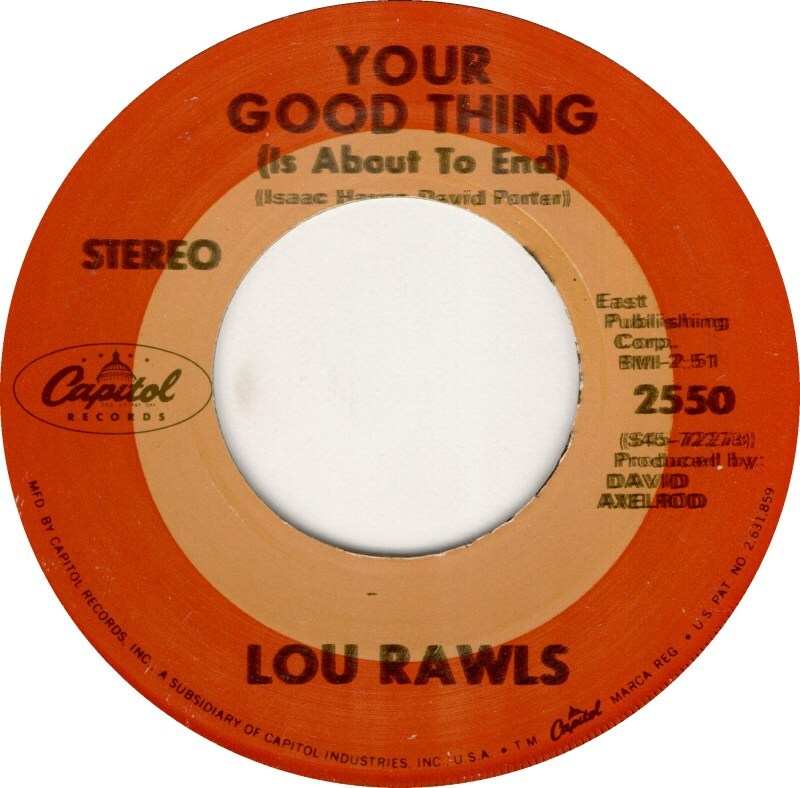 While there are many highlights throughout the career of Lou Rawls, few songs better present all of his strengths than what one can hear on his fantastic 1969 single, "Your Good Thing (Is About To End)." In many ways, the music that backs all of "Your Good Thing (Is About To End)" is as difficult to define as Rawls' vocals in that they clearly pull from a number of different styles. As the first notes descend from the record, the piano suggests that this will be a slow, almost jazz-like song, and yet there is almost instantly a tension that is present. Along with this tension, one can almost "feel" the smoke in the room, and "Your Good Thing (Is About To End)" quickly becomes a very intimate musical experience. It is the way that the song slowly sways back and forth, completely captivating the listener, before almost overflowing with emotion as the horns build that makes this song stand out from the rest of Lou Rawls' catalog. There are times when the piano has an almost saloon-style sound, and the quick, repeating guitar riff has an unexpectedly funky groove, adding another influence on the overall musical construction. In reality, there has simply never been another song that brought the slow-burning, funk-filled soul like what can be experienced on "Your Good Thing (Is About To End)," and yet in some ways, this is slightly less surprising when one notes that the music was arranged by the legendary Isaac Hayes along with David Porter. Yet it is the way that the musicians execute this interpretation of the song which allows the true genius of the composition to be felt, and it is impossible to not be completely caught up in the amazing mood. However, while the music all throughout "Your Good Thing (Is About To End)" is fantastic in a way all its own, there is no arguing that it is the uniquely beautiful voice of Lou Rawls that makes this, like each of his songs, beyond the ability of nearly any other performer in history. Much of the appeal of Lou Rawls comes from the fact that his vocal range seems to truly have no limit, as he is able to seamlessly jump from deep lower notes to the upper registers without ever breaking the mood for flow of the song. There is a constant power within his singing that is impossible to ignore, and it is this element, combined with the massive amount of emotion that he injects into every phrase which has turned him into the legend that he remains to this day. All across "Your Good Thing (Is About To End)," Rawls is at his finest, as the powerful cry he brings to every line is able to perfectly match the powerful swinging groove of the music. The way that Rawls is able to spin the track into a song of warning to his lover, yet seem somehow vulnerable is one of the most amazing aspects of the entire song, and in many ways, once one hears Rawls' performance here, every other soul singer in history is quickly put into perspective. Whether it is due to the absolutely perfect singing or the superb level of emotion in every word, there is simply no other song in history that can even remotely compare to Lou Rawls on "Your Good Thing (Is About To End)." Though many are unaware, the Lou Rawls version of "Your Good Thing (Is About To End)" is not the original, and many later recordings would come from a wide range of artists. The song was originally recorded by Mable John a few years before the Rawls version, and while it had moderate sales, it pales in compassion to the success of Lou Rawls' recording. Over the decades that have passed since this release, everyone from Bonnie Raitt to The Bar-Kays to Boz Scaggs has re-recorded "Your Good Thing (Is About To End)" in their own way, and yet none have been able to come close to the emotion and sheer musical beauty found on Lou Rawls' rendition. In many ways, it is the fact that this version is able to retain the gritty side of soul music, yet come off as far smoother and almost more intelligent in sound that sets it apart from other music of the era; and one can easily see this as one of the most important shifts in recording style. In fact, following Rawls' release of "Your Good Thing (Is About To End)," there were a number of new styles of soul that began to emerge, and one can see almost all of them as taking a large part of their sound from this song, as well as a number of other parts of the Rawls' catalog. The way that this powerful, yet inviting voice conveys such a strong and wide array of emotions was what made Lou Rawls the icon that he remains to this day, and he rarely sounded better than on his 1969 single, "Your Good Thing (Is About To End)." November 26: Béla Fleck & The Flecktones, "The Sinister Minister"
Though it is a rare occurrence, when an artist is able to bring a non-tradiational instrument in as the lead sound in any form of music, the results are almost always worth hearing. If the artist in question is also a brilliant composer, and has an unparalleled understanding of countless forms of music, the sounds they create will quickly gain widespread accolades and attention. Of course, if that artist is also able to surround themselves with musicians of equal or greater talent, the group in question will certainly take on a musical definition all their own, and this is exactly the case with Béla Fleck & The Flecktones. For the better part of three decades, the group has been recording and releasing some of the most uniquely amazing music in all of history, an yet few can argue that there is another group in history that has remained as musically undefinable. Incorporating everything from electronica to jazz to classical to bluegrass to funk and countless other genres in their music, Béla Fleck & The Flecktones manage to continually reinvent themselves, whilst keeping a core sound that one must experience firsthand to properly appreciate. Due to their extensive recorded catalog, as well as the unrivaled level of musicianship within the band members, it is impossible to point to a single song as their "best," and yet one can understand why so many hold Béla Fleck & The Flecktones in such hugh regard by hearing their phenomenal 1990 song, "The Sinister Minister." Few will argue that among every band from every genre of the past thirty years, that there are many, if any, that can even remotely compare to the talent of the rhythm section of The Flecktones. Furthermore, there are very few bassists from any point in history that can rival the talent and creativity of Victor Wooten, and it is his brilliant playing that kicks off "The Sinister Minister." It is the unique way that Victor Wooten is able to create so much emotion and feeling with an almost minimalist musical approach that makes his sound so distinctive, and it is also the fact that he seems to be simultaneously pulling from multiple "schools" of bass theory. Though he brings a funky groove that is far beyond that of any of his peers, it is the way that he creates jazz-like solos throughout "The Sinister Minister," enabling his bassline to become far more than "just" an interpretation of the rhythm. Yet it is also the way that his sound interacts with that of The Flecktones' "drummer," his brother, Roy "Future Man" Wooten." The sound of the drums all across the catalog of Béla Fleck & The Flecktones are completely distinctive, and this is due to the fact that Future Man plays a custom "synth-axe/drumitar," allowing for the rhythms and tempos to expand in an almost infinite level. Yet it is the smooth, almost hypnotic mood that Future Man lays under each song which makes them all the more intriguing, and this completely unique sound only adds to the overall undefinable appeal of Béla Fleck & The Flecktones. However, the other two musicians that comprise Béla Fleck & The Flecktones are without question equally as important and as talented as the rhythm section, and it is the fact that there is so much skill and passion within the playing that vaults "The Sinister Minister" so such heights. Handling a number of different instruments on the track, it is the harmonica from Howard Levy that stands out the most on this song. The way that he slides around the other instruments lends an almost blues-like feel to "The Sinister Minster," and yet it also serves as the ideal balance between the deep bass groove from Wooten and the higher-octave brilliance of the groups' namesake. Few can argue that there is any other living banjo player that even comes close to the sheer talent of Béla Fleck, and yet it is his endless creativity that has given the instrument an appeal far beyond that of the almost stereotypical audiences one might assume. Both in speed and feeling, his performance all across "The Sinister Minister" is one of his finest, as he shows the impact he can create from brilliantly constructed finger-picked progressions just as much as the more melodic, chord based moments. It is this diversity in ability, as well as the outright unique sound that the banjo creates that makes "The Sinister Minster" so fantastic, as well as defining the wonderfully distinctive arrangements that make up the groups' recorded catalog. Truth be told, if one were to attempt to "force" Béla Fleck & The Flecktones into any category, perhaps the most understandable would be that of jazz, as the group is more than willing to "take turns" and let the other members have their time to solo. It is this unselfish approach that leads to all of the songs from Béla Fleck & The Flecktones becoming so fantastic, and yet it is the seamless manner with which the lead is passed throughout "The Sinister Minister" that sets it further apart from the rest of the bands' catalog. In fact, it would be a live recording of this song that would garner the group a Grammy Award in 1997 for "Best Pop Instrumental Performance." When one considers that Béla Fleck & The Flecktones were given any award containing the term "pop" almost forces the fact that in the end, the compositions that the group creates have an appeal that creates its own boundaries, as opposed to pushing through any that had been previously put into place. That is to say, regardless of ones' personal musical preference, it is the absolutely individual sound and approach that one can find within the music of Béla Fleck & The Flecktones that allows them to pull legions of fans from across the musical spectrum, and this in turn is why one can find so much diversity within their music. While there is rarely an "off" moment on any of their albums, one can easily argue that Béla Fleck & The Flecktones have rarely sounded better than what one can hear on their 1990 song, "The Sinister Minister." November 25: Ike & Tina Turner, "Proud Mary"
Throughout the long history of recorded music, there are a handful of names that regardless of the generation or musical preference, stand as iconic. Simply due to their massive impact on the world of music in general, these names have managed to transcend such boundaries, and they are almost more historical in nature than being strictly related to "only" the world of music. While some of these names have faded a bit over the years, there is no question that the names of Ike and Tina Turner command as much respect and reverence today as they did during the peak of their popularity well over three decades ago. Though both of them certainly made names for themselves as solo artists, it was much of the work that they did as a team that made them the legends that they remain to this day, and all across the 1960's and 1970's, one can find examples of their amazing energy and musical talents, and few artists from any era can even remotely compare to the sound they created. However, it was after they had been established for a number of years that the duo went after what is one of their most memorable recordings, as they attempted to make a cover that would outshine the original. Though this is without question one of the more difficult things one can attempt within the world of music, one would be hard pressed to say Ike and Tina Turner did not succeed with anything less than massive success with their 1971 take on the now-classic song, "Proud Mary." In many ways, it is almost impossible to remember a time when this version of "Proud Mary" did not exist, and yet the reality is that the "original" take had been released only two years earlier by Creedence Clearwater Revival. Truth be told, the Ike and Tina Turner version of this song is a pefect representation of everything that made them such a legendary pairing, as the song begins with one of the slowest, deepest grooves that has ever been recorded. The way that "Proud Mary" seems to slowly bounce along enables an amazing amount of tension to be created, and it is the way that this tension gives way which pushed the track to truly a legendary status. It is in fact the second half of the orchestration composed by Ike Turner almost completely buries the original version, as the energy and sonic arrangement is far beyond that of nearly every other recording in the entire history of music. If there was ever a song that one could claim "explodes off of the record," then this is it, as the moment that the band kicks in (following the deep grooving first half), it is impossible to not be completely drawn into the excitement and all out feeling of a party. The energy never lets up for even a moment, and it is the way that the horns combine with the bass and array of other sounds which almost instantly creates a sound and presence that defies description and to this day has not been equaled in any sense of the word. When one combines this sensational sonic arrangement with the absolutely unmistakable voice of Tina Turner, it is almost impossible for the results to be anything less than stellar, and one can easily argue that it is this performance which defines her entire career. Much like the musical arrangement shows both sides of the talent of Ike Turner, it is within the vocal performance which displays the equally impressive sides of Tina Turner's voice. Throughout the first part of "Proud Mary," Tina shows the absolutely blissful, soul-styled growl that set her so far apart from her peers, and it is the soft beauty within this portion of the song which helps to heighten the mood, as well as appease the fans of much of her early work. However, much like the music of the second half of "Proud Mary" is the highlight, the same can be said of Tina's vocal performance, as she removes any limits or apprehension and allows her voice to soar as it wishes, often reaching never before heard heights. The power that comes through as she borders on shouting is in many ways everything that makes the "art" of singing so fantastic, as one can feel and hear the sheer joy within her performance, and this vitality and affirmation of life never loses any of its impact even after repeated listenings. This ability to "never get old" is what cements the place of both the song and vocal performance as the finest in all of music history, and there is never any mistaking this extraordinary moment that has never been equaled. In reality, one can count the number of cover songs that have out-done the original on a single hand. This is without question one of the most rare occurrences in recorded music, and the fact that Ike and Tina Turner were able to succeed in this task, especially given the short time following the original, is a testament to their exceptional talents, as well as their unique musical style. It is the reality that the song has such contrasting parts, yet manages to work perfectly as a single piece that makes "Proud Mary" all the more impressive, and though many other artists have attempted to copy this musical formula, none have come even remotely close to the sound and power found here. Whether it is the way that the horns seem to create an intoxicating second vocal line, or the loose, walking bassline, the music that runs though manages to display everything that is great about rock and soul music, and there is simply no parallel from any other period in music history. When one combines this with the iconic vocal performance from Tina Turner, the song is quickly vaulted to a level rarely achieved, and in many ways, this rendition of "Proud Mary" defies any sort of musical classification. The fact of the matter is, regardless of ones' age or musical preference, the power and presence on this track are impossible to ignore, and it is this reality that has turned Ike and Tina Turner's 1971 cover of "Proud Mary" into one of the greatest songs in the entire history of recorded music. Daily Guru: "Something Old, Something New #28"
November 24: MC Lyte, "Cha Cha Cha"
Though many will try and deny the reality of the idea, when one looks all across the entire history of recorded music, there is simply no arguing that regardless of the era or genre in question, every musical form has been dominated by male performers. This is not to say that no females were present, but the overall numbers are extremely out of balance, and there is no other genre where this is more obvious than within the world of hip-hop music. For more than three decades, the style has been overpowered by male emcees and DJ's, and a majority of the female performers simply do not receive the same accolades and respect as their male counterparts. However, along this same time-line, few can argue that the handful of female emcees that have been given their due have been anything less than spectacular, and there are few emcees from any era that can compare to the style and sound of MC Lyte. In fact, it was MC Lyte that made it a point to quite often show this inequality as well as the rampant misogyny within the world of hip-hop, and here first few solo albums are both lyrically devastating, as well as absolutely flawless in every other element of the music. Due to this reality, there is no question that MC Lyte stands as one of the most important figures in all of hip-hop history, and she was rarely better than what one can find on her phenomenal 1989 single, "Cha Cha Cha." While the performance from MC Lyte on "Cha Cha Cha" is certainly something beyond fantastic, one must also give ample credit to the music and beats over which she rhymes, as they themselves are of equal quality and timeless in nature. Though many may not be aware of the song itself, the combination of samples and beats that comprise the music to "Cha Cha Cha" have become absolutely legendary, and have been reused over the years that followed the release of the song. Yet it is the choice of sample that sets the track far apart from most other songs in hip-hop, as the core music used on "Cha Cha Cha" is actually taken from Kraftwerk's, "The Man Machine." It almost goes without saying that pulling from the catalog of a group like this was a rarity within the world of hip-hop, and this shows the wide range of musical knowledge within DJ K-Rock. It is the way that he is able to take this non-traditional sample and make it work perfectly within a hip-hop sound that shows his exceptional level of talent, as the beats and scratches that he deploys over the sample quickly turn "Cha Cha Cha" into an absolute hip-hop classic. In fact, one can easily make the argument that it was due to this unexpected musical style that the song was able to cross into other styles, and it quickly rose to the top of the rap charts, almost instantly cementing its place as a classic of hip-hop music. However, even though this sound was uniquely intriguing, the fact remains that the power and presence of "Cha Cha Cha" comes from the dazzling display of skills and sound that comes from MC Lyte herself. In almost every aspect, MC Lyte is completely distinctive, and it all begins with the amazing calm control that she brings to her rhyming style. There is never a moment where her vocals sound the least bit forced, and it is the natural, focused delivery that makes her songs all the more captivating. The clarity within her rhyming also set her far apart from her peers, as it is clear that each word she brings is as important as any other, and the messages within her songs cannot be missed. To this end, while MC Lyte often went after issues of misogyny and injustice within her rhymes, on "Cha Cha Cha," she shows that she can bring the ego and battle style as perfectly as any other emcee. There is a drive and strength within every word she speaks on the track, and there is no question that had they not been impressed by her earlier efforts, "Cha Cha Cha" certainly left any doubters with no choice but to hail her as one of the greatest emcees of her era. The way that she flips her words and creates such powerful images remains one of the cornerstones of the world of hip-hop, and serves as enduring proof that females are just as capable at bringing devastating lyrical prowess as any of their male counterparts. As the decades have passed, the name of MC Lyte has become one of the most highly respected in the entire history of hip-hop, as she remains one of the most pivotal figures in the rise of females within the genre, as well as the overall development of the style in general. The way that she seems to so effortlessly drop her brilliantly complex rhymes is without question as good as one can find anywhere in the history of the genre, and in many ways, the fact that she is a female quickly becomes unimportant. It is the power within each line she rhymes, as well as the fantastic word-play that she presents which quickly draws in the listener, and the fact that her style is so raw and authentic vaults her far beyond nearly any other performer of her era. Yet it is also the seamless way that she blends her sound with the music over which she performs and the DJ work of K-Rock that sets songs like "Cha Cha Cha" far beyond the efforts of others, as she avoids the disjointed sound that one can find on many of the other "big hits" from the early years of hip-hop music. It is this complete package and absolutely perfect deployment of every element that can be seen as one of the trademarks of the sound of MC Lyte, and she rarely sounded as good as what one can experience on her superb 1989 single, "Cha Cha Cha." Daily Guru: "Ask The Guru #01"
In today's special edition of The Daily Guru on YouTube, I answer questions sent in by viewers. Share and enjoy. November 23: The Crystals, "Da Doo Ron Ron"
Song: "Da Doo Ron Ron"
Though many may wish to believe that it is some musical element which links them all together, the fact of the matter is that the true definition of "rock and roll" lives within a certain spirit in the music in question, and it is this tone which enables one to place the more modern style of rock music on the same plane as the earliest vestiges of the sound more than half a century ago. Furthermore, once one eliminates the actual musical contrstruct for purposes of definition, one can see the way that the rock and roll attitude manifested itself within countless other parts of music, and it is impossible to deny the strong links to the style within what many critics classified as the so-called "girl group" sound. While some such acts were more restrained, if not quieter, there were a number of female-led groups that took a far more aggressive and "fun" approach, and few were equal in any aspect to the power and presence of The Crystals. Recording some of the most well-known hits of the era, one can easily make the case that before the "British Invasion," The Crystals represented everything that was great about the American style of rock music. Though they had a number of massively successful songs throughout their career, there may be no better a definition of The Crystals' unique sounds than in their fantastic 1963 single, "Da Doo Ron Ron." From the moment that "Da Doo Ron Ron" begins, it is clear that the song will be a far cry from a majority of the "girl group" sounds of that era, as there is an edge and swing from the onset that quickly captivates the listener. It is the blurted horn which opens the song, quickly giving way to one of the most infectious rhythms ever recorded that makes the song so enjoyable, and one can easily imagine how "Da Doo Ron Ron" would have lit up any party at the time. The way that the sound seems to burst forth from every angle represents some of the finest work in the history of Phil Spector's "wall of sound" style, and it is the way that he is able to perfectly blend together the big band horn sound with the rockabilly piano and the flawless vocals that makes this such a wonderfully unique moment in music history. "Da Doo Ron Ron" quickly takes on a brilliant swing, and in many ways, it is songs like this that are able to transport the listener back to the time during which it was released, as the authenticity and purity of the music is nothing short of perfect. The stomp that runs throughout the song would be used by countless similar groups in the years that followed, and it is due to the aggressive sound and tone of the song that makes it easy to argue that not only was "Da Doo Ron Ron" a brilliant single, but also a clear turning point in the way that pop songs were orchestrated. While one cannot overlook the power and historical significance of the musical arrangement found here, there is no question that the focus of the song is on the absolutely phenomenal vocals from The Crystals. Though by this point in their career, they had gone through a few different configurations, "Da Doo Ron Ron" features the lead voice of Dolores "LaLa" Brooks. Truth be told, Darlene Love had originally recorded a lead vocal for this song, but in the end, Spector used the Brooks take, and once one hears the song, it is impossible to consider any other voice being as perfect within this setting. There is a grit and strut to Brooks' singing that was a bit more aggressive than most other "girl group" songs, and yet it is also this aspect that would strengthen the role of females within the world of music. The fact that she is able to inject this sense of power into the song, whilst still bringing a vocal that is as "classic" as any other sets "Da Doo Ron Ron" further apart from other songs of the era, and it is this combination that has played a large role in the songs' perseverance over the decades. However, it is also the way that Brooks' voice blends so perfectly with the rest of the group, and the ringing resonance of their harmonies is without question one of the most outright enjoyable sounds to ever be captured on tape. All throughout this era in music history, there were countless combinations of "girl groups" that were pushing the idea of popular music into many different styles. Whether it was the way that some incorporated the "doo-wop" sound, the softer, jazzy tones, or the more soulful blues numbers, there is no question that the existence of this musical movement was one of the most vital in the development of nearly every style of music. However, most tend to overlook the contributions to rock and roll that this era produced, as it would quickly be overshadowed by the musical occurrences throughout 1964. Yet in retrospect, one cannot deny just how important these transitional years were, as it was acts like The Crystals that were able to take the sounds to rockabilly and give them a new, modern flare. The way that the group were able to so perfectly match the attitude within their vocals to the slightly aggressive, swinging sound of the music over which they sang remains one of the most beautiful and mesmerizing moments in the entire history of music, and it is this combination that set The Crystals far apart from every other group with a similar label. The fact that The Crystals had so many different configurations leads to the group having a number of diverse sounds within their singles, and yet there is no question that on every level, the group was at the finest for their magnificent 1963 single, "Da Doo Ron Ron." Daily Guru: "Something Old, Something New #27"
November 22: Townes Van Zandt, "No Place To Fall"
Song: "No Place To Fall"
While one cannot exactly fault a certain musician or band for attaining a level of fame, there is no question that in many cases, the truly talented and inspiring musicians often go their entire careers without achieving these more commercially measured heights. However, it is within this reality that one can also make the case that without the "trappings" of widespread fame or time under massive spotlight, an artist is able to be far more honest and true to their work, and this in turn often results in some of the most beautiful and powerful music the world has ever known. One can see this as why for many bands, their first record is their strongest, as it represents their sound in its most pure form, and yet even though he made music for more than three decades, this sense of purity and beauty was never lost in the music of Townes Van Zandt. It is once one looks at his long career where the argument can easily be made that to this day, Van Zandt receives little of credit he so clearly deserves, as regardless of what ones' personal musical preference may be, the songs he recorded easily cut through and hit at the most human level that one can imagine. All across his recorded catalog, there are songs that have become standards within many different genres, and yet one would be hard pressed to find a more definitive and outright moving song from any point in history than what can be experienced on Townes Van Zandt's soulful 1978 ballad, "No Place To Fall." As "No Place To Fall" begins, one can hear the almost classic sounds of country music, and get at the same time, there is a tone and a mood to the song that reaches far beyond such a singular classification. The somber, rhythmic strumming of the lone acoustic guitar almost instantly gives one the feeling of a cowboy sitting alone by a campfire, and get the same time, when can the just as easily picture the song being played in a quiet apartment building in the middle of a huge city. As this solitary sound softly blends with the slide guitar, the interplay between the two becomes the very definition of the power and beauty that music can achieve when it is created from the heart. Not far into the songs' introduction, of third guitar enters, and is a way that each of these guitars follows its own path throughout the song that makes "No Place To Fall" such a special musical experience. It is the moment when the bass guitar joins the mix one can fully grasp the phenomenal mood that Townes Van Zandt has orchestrated, and there is a fragile, almost delicate feel to the arrangement that simultaneously gives a nod to the classic country-western sound, whilst keeping a uniquely modern tone. The light drumming that finishes off the sonic structure gives just enough of a pace and rhythm to the song to keep it moving forward, and yet it is the slow burning overall atmosphere that sets "No Place To Fall" so far apart from every other recording in the entire history of music. However, while one cannot overstate the amazing mood that is set forth by the music, is the equally intriguing vocals of Townes Van Zandt that vault "No Place To Fall" to a height that has rarely been reached. It is the gentle, almost simple honesty within the voice of Van Zandt that almost effortlessly crosses through any musical boundary, and his singing is all the proof one needs to understand the power of real musical talent. Even at the moments were most artists would have gone back and re-recorded, Van Zandt stays true to his sound, entities these almost "faulted" points throughout the song that are in many ways the trademark of Townes Van Zandt. There is a calm, gentle, and welcoming tone within every word that Van Zandt sings, and one cannot help but be completely drawn in by his voice. Yet is also the almost brutally honest lyrics which he sings that makes "No Place To Fall" such a phenomenal musical experience, and while he had already proven his ability in this arena on his previous releases, one can easily make the argument that "No Place To Fall" is the finest lyric of his entire career. Again, is a level of absolute honesty and the almost "plain" manner with which he describes these feelings that makes the song all the more intriguing, and this stands as one of the few songs in music history that once heard can never be forgotten. Truth be told, "No Place To Fall" actually first appeared on Van Zandt's live album that was released a year previous, and yet it is the quiet, almost meditative tone that comes through the studio version that makes it far superior. In the years that followed the release of "No Place To Fall" a handful of cover versions emerged, and yet none were able to capture the mood and overall sonic beauty that one can experience on the original. Even in recent years, The Little Willies recorded their own version of the song, and while it is certainly fantastic in its own right, there is no question that there's some intangible element still missing. It is with this in mind that one can make the argument that the "missing element" is the soul and spirit of Townes Van Zandt, as once when here's the rest of his recorded catalog is quite clear that he was a musician beyond the ability of nearly any other. A large number of his original songs have been recorded by other artists and made famous, and yet he himself has remained comparatively unknown. Yet one can theorize after hearing the sound mood of his songs that perhaps this unintentional anonymity was exactly what Townes Van Zandt wanted, is allowed him to stay true to his songs and words for his entire career. Though there are certainly a number of songs in the history of music which one can label as "beautiful," none come even remotely close to the way that that word fits Townes Van Zandt's absolutely blissful 1978 song, "No Place To Fall." November 21: Daily Guru, "Gurucast #99"
2. Soccer Team, "Letter To Saint Thomas Aquinas" 3 Song 7"
5. The Evens, "Timothy Wright" 2 Song 7"
November 20: The Four Seasons, "Big Girls Don't Cry"
Song: "Big Girls Don't Cry"
Though it has become somewhat "glossed over" due to the massive dominance of a certain band that began taking over the world in 1964, the reality is that the first few years of the 1960's yielded some of the most impressive and unique music in all of history. As jazz and the "doo-wop" sound began to give way to the more rock-based pop style, it was the fusions of these approaches which breathed an entirely new life into the world of music. It seemed that almost every month, a new take on these styles was emerging, and it was often when the "doo-wop" sound took on a more modern flare that the finest and most unforgettable moments of these years occurred. To this end, while they would (like other bands of the era) become overshadowed by the aforementioned British band, there were few acts of the entire 1960's that were as successful in every sense of the word as The Four Seasons. Combining some of the most impressive singing talents with a vocal range that has never been matched, the group rattled off a staggering number of hit singles throughout the 1960's, with more than a dozen finding their way into the top ten, including a handful of number one singles. Due to this massive success, it is nearly impossible to choose just one as their definitive recording; and yet one can argue that everything that made The Four Seasons into the legends that they remain to this day can be heard on their iconic 1962 single, "Big Girls Don't Cry." In many ways, the music that backs the singers on "Big Girls Don't Cry" is as definitive of the era as one can find anywhere. Though it is rather simplistic in its arrangement and structure, there is no question that this song is all about the spirit that burst forth from the playing. Each musician is clearly enjoying the job they are doing that day, and this mood enables "Big Girls Don't Cry" to quickly become nothing short of completely captivating. The reality is the majority of the allure of this song comes from the multiple rhythms that are being simultaneously played on different instruments ranging from standard drum kits to simple hand claps. It is the way that these sounds interact with one another, along with the fantastic and unique rhythm from the piano that helps to give "Big Girls Don't Cry" a sounding presence unlike any other song recorded history. There is a sway and a groove that persists throughout the entire song that makes it almost impossible not to dance along, and it is due to this rhythm and groove that makes it understandable why the song was such a massive success almost instantly upon release. Furthermore, this pure and almost organic musical approach has enabled the song to easily weather the decades, and it stands as one of the most unforgettable and truly perfect songs ever recorded. However, it almost goes without saying that while the musical arrangement found on "Big Girls Don't Cry" is nothing short of perfect, it is the vocal performance by each member of The Four Seasons that turns the song into a truly iconic moment in history. While one cannot write-off the singing of the other members of the group, it is the now-legendary lead vocals from Frankie Valli that truly stand out. It is the way that he seems to almost have two voices on the song that makes it so significant, and one would be hard-pressed to find another singer of any era that can come even remotely close to this sonic diversity. From the slightly gritty, perhaps edgy sounds on the verses, to what has perhaps become his trademark "cry" at the end of each line, there is no question that "Big Girls Don't Cry" remains one of the most stunning vocal performances in history. However, due to the significance of Valli's singing found here, most people tend to overlook the rather interesting lyrical content of the song. Though at first glance it may seem like a "standard" song of teenage love and longing, the reality is that "Big Girls Don't Cry" takes a rather unusual spin, as the protagonist's plan goes awry quickly when his love has no problem accepting his request for breakup. In many ways, one can see this as a nod to what would become known as "girl power," and yet due to Frankie Valli's absolutely stunning performance, this aspect goes missed amongst most listeners. In many ways, the overall success of "Big Girls Don't Cry" is slightly less surprising in retrospect when one considers that only two months earlier, The Four Seasons had managed their first number one single with, "Sherry." Truth be told, "Big Girls Don't Cry" was actually recorded during the same sessions as "Sherry," and this is much the reason that one can hear a number of similarities between the two songs. However, there is no question that "Big Girls Don't Cry" easily stands on its own, and it would be the song that would largely define the group for the remainder of their exceptionally lengthy career. Furthermore, "Big Girls Don't Cry" would make a number of appearances throughout various forms of popular culture, perhaps most memorably when it was performed by the legendary Lucille Ball and Vivian Vance on I Love Lucy. In more recent years, "Big Girls Don't Cry" has been covered by everyone from Big Bird to some rather odd takes by punk rock bands, and this in itself shows the massive range of impact that the song has had in terms of both genre as well as generations. 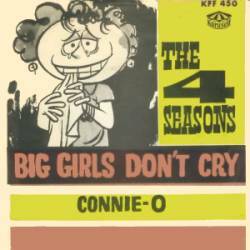 Whether it is due to the adjustable musical arrangement, or the absolutely unforgettable vocal performance by the entire group, there's simply no arguing the historical significance and outright musical perfection that one can experience all across The Four Seasons' magnificent 1962 single, "Big Girls Don't Cry." November 19: Art Pepper, "Straight Life"
Regardless of the era or style of music in which a performer plays, there is no question that one of the most difficult things to overcome is in the ability to make your sound unique within the genre that you play. Whether it is a guitarist trying to create a distinctive tone or approach or a singer attempting to have an individual sound or tone, it is this element which separates the true giants of music from the rest of the pack. Though this has never been an easy task, one can make the case that it was at its most difficult within the world of jazz during the mid-to-late 1950's, as the true legends of almost every instrument were in their prime, and it was nearly impossible to not be labeled as a "knock off" of one of these performers. In the world of saxophone playing, it seemed almost unthinkable to escape the shadow of Charlie Parker, and yet it was his ability to do just this, as well as compose some of the most stunning movements in music history which cemented the legend of Art Pepper. 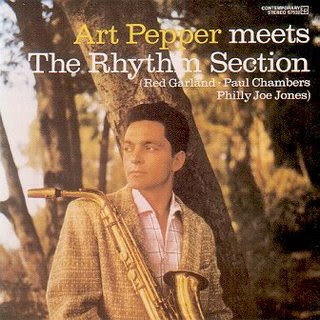 Taking an approach that was far more emotive and often more intense than almost any of his peers, Pepper stands today as one of the more easily recognized sounds on record, and there is no question that he reached his creative apex on his 1957 release, Art Pepper Meets The Rhythm Section. Standing as absolute jazz perfection from end to end, Art Pepper rarely sounded better than on the albums' high-point, the superb recording, "Straight Life." To garner an album title as one finds here, it is safe to assume that the rhythm section found on the album holds some sort of significance, and in many ways, this is a massive understatement. The players found backing Art Pepper all across the album are none other than Red Garland, Paul Chambers, and "Philly" Joe Jones, the trio were best known as the backing team behind the one and only Miles Davis. Taking this into account, one would have rather high standards for such a recording, and it is on "Straight Life" where the quartet completely solidify as a single unit. The bass from Chambers stands as one of the finest moments of his entire career, as he brings a loose freedom that is rarely heard elsewhere, and one can almost feel the sheer enjoyment coming through in his notes. There is a tight pattern between his sound and that of Jones' drums, which seem to truly be in a world of their own, and it is often the way that he uses his cymbals which prove the most exciting on the track. It is this style and sound that Jones would also bring to later works with his previous band leader, and in many ways, one can see all three members of the backing band finding new ways to develop their own sound. Red Garland works as a fantastic contrast to Pepper's main lines, and it is within Garland's performance where one can hear and appreciate just how tightly the band worked as a single unit. However, even though each of the backing members are given their own place to solo and shine, it is the performance on alto saxophone from Art Pepper that stands as the most amazing aspect of the entire song. Throughout "Straight Life," Pepper plays with an almost dizzying speed, and yet it is the precision with which he hits every note that stands as so stunning. At some points, Pepper is playing so fast that it almost seems as if he is pressing his band-mates to see if they can keep up, and yet he never loses focus of the main theme, or sacrificial any quality in this apparent pursuit of his maximum tempo. In fact, as "Straight Life" progresses, Art Pepper seems to be increasing his playing speed, and one can almost feel the song as having three different "gears," as he shifts faster with the end of each elongated phrase. It is the way that the blazing speed of Pepper's playing seems to contrast with the almost laid-back "cool" of the rest of the band that makes "Straight Life" such a significant moment in music history, as there are few other recordings from any point that so perfectly present not only the differences in the main schools of jazz at the time, but also how brilliant they could sound when they were properly combined. At every turn, Art Pepper seems to have a new musical idea to explore, and it is this upbeat, passionate approach which makes "Straight Life" the highlight on an album that is absolutely flawless. Yet along with the phenomenal musical performances given by all four performers on this track, it is the oft-debated realities surrounding these sessions which make these musical achievements all the more impressive. As the legend goes, Art Pepper was not made aware of the actual recording session until the morning of the day that they occurred, and until he walked into the studio, he had never met any of the other three musicians. It is also said that the saxophone that he brought to the session was in a state of disrepair, and he was also battling a significant drug problem at the time. While much of this has been debated over the years, the reality that the four had never met has rarely been questioned, and this in itself makes the resulting music almost unfathomable. There is a chemistry between the quartet of players that is far beyond that of many groups that had played together for years, and this is a testament to the exceptional level of talent within each musician. Yet one can also see this reality as the result of the "theory" with which Art Pepper always played, as he made a point that music was more about passion and emotion than "notes on a page." Due to this, one can infer that there was a unique freedom and level of enjoyment during the recording session, and one can hear and understand how this yielded uniquely brilliant results in Art Pepper's most impressive musical moment; 1957's "Straight Life." November 18: Van Morrison, "Brown Eyed Girl"
There are certain moments scattered randomly across the long history of recorded music that regardless of the amount of time that passes, never lose their impact. These elite few songs are able to constantly take a listener back to the time during which it was recorded, or a time in the life of the listener, and even as the years go by, these songs manage to keep their relevance and fresh sound. Clearly, the creation of such songs is rarely anything short of unpredictable, and yet there are one or two musicians in the history of music that have shown a unique talent for recording songs of such significance. Standing far apart from his peers, as well as the performers from any other generation, there are few singers and songwriters with a catalog that is even remotely comparable to that of the great Van Morrison. For more than four decades, Morrison has been releasing some of the most uniquely beautiful songs of all time, with his orchestrations running the gamut from pop to folk to jazz and many other styles. Due to this wide range in sound, it is difficult to cite a single album as his finest work, and this also leads one to consider each of his songs for their own worth; as opposed to their relevance within a larger record. While there are certainly many of his songs that have become classics, there may be no other recording in the Van Morrison catalog that holds the same power and historical importance as his unforgettable 1967 single, "Brown Eyed Girl." Even the mention of the name of the song almost instantly brings to mind the now-iconic musical arrangement, as the opening riff "Brown Eyed Girl" is without question one of the most memorable in the entire history of recorded music. The guitar riff sets the perfect mood for the entire song, and one cannot help but get caught up in the almost Calypso-style tone that runs throughout "Brown Eyed Girl." Yet it is rather strange, as the main musical arrangement is a somewhat simple orchestration, working only three chords in a predictable pattern. However, it is the spirit and energy with which these notes are played that enables the song to become so much greater, and this sense of enjoyment in playing is one of the many ways that "Brown Eyed Girl" separates itself from other recordings of the time. The song is also rather unique due to the rhythms that run throughout, as there is only a light drumming for a majority of the song, and these drums are mixed "behind" the hand clapping. In many ways, the hand claps became another reason that listeners found themselves completely enamored with the song, and the finishing touch of the soft, deep grooving bass is nothing short of perfect. It is the way that all of these sounds come together in an exciting, yet almost unassuming manner that makes "Brown Eyed Girl" such a special moment in music history. However, while it is impossible to understate the impact and perfection found within the music on"Brown Eyed Girl," it is difficult to argue that the true force behind the song is the voice of Van Morrison. While he had made a small name for himself with his previous band, Them, it would be his singing on "Brown Eyed Girl" that would turn him into an absolute superstar. There is a spirit and power within his singing that serves as the ideal compliment to the music over which he sings, and the sheer joy in his voice makes this one of the few songs in history with which one cannot help but sing along. The slight grit within the voice of Van Morrison enables "Brown Eyed Girl" to retain a slight edge or attitude that was largely absent from pop songs of this style, and there is no question that this aspect was one of the many reasons the single quickly cracked the top ten on the sales charts. However, it is also the youthful, almost timeless quality of the word which Morrison sings that garnered this attention, and to this day, "Brown Eyed Girl" remains one of the most instantly recognizable lyrics of all time. Truth be told, when the song was first released, many radio stations felt that the words were a bit too risqué, and the "laughin' and ah runnin'" line from the second verse were edited over the "making love in the green grass" line on the third verse. Yet even with this change, the sentiment and power of the song were not diminished in the least, and Morrison used this performance to set the standard for his entire career. Though most are completely unaware of the reality, "Brown Eyed Girl" also stands as one of the great "musical tragedies" in history, as the financial implications of the recording and sales perfectly highlight everything that was (and in some ways remains) wrong with the music industry. Having recently split ways with his previous band, Van Morrison rushed to New York City when he heard that Bang Records wanted to give him a solo recording contract. However, due to his desire to get into a recording studio as quickly as possible, he signed the contract without getting any legal advice, and the paperwork he signed prevented him from receiving any royalties from "Brown Eyed Girl" until he himself had paid for the entire recording session. Even after such monies were recouped, there is no question that much of the income from the massive sales of "Brown Eyed Girl" had been subject to "creative accounting," and in the end, Morrison received comparatively no financial compensation for the sales of "Brown Eyed Girl." However, the sales of the song did turn him into an outright superstar, and the next few albums he released would cement his place as one of the most talented performers in the entire history of music. From the iconic musical arrangement to the absolutely perfect vocal performance, there has simply never been another song that is on par with Van Morrison's legendary 1967 single, "Brown Eyed Girl." Daily Guru: "Something Old, Something New #26"
November 17: The Box Tops, "The Letter"
As the 1960's began to wind down, there is little arguing that anything other than the "psychedelic sound" was dominating almost every style of music. From rock to blues to jazz, one can find this new approach heavily infused into each sound, and a majority of the most well-known songs of the era easily support this idea. However, there were also a number of bands that seemed to have little interest in the often lengthy and self-indulgent musical forays that came with this new musical style, and it was these artists which would create the building block for a majority of the next decade in musical exploration. While this is not to say that the psychedelic sound was completely absent from their music, it was the artists that took larger portions of influence from other styles that became the "underground," and there is perhaps no more impressive a band from that time period than The Box Tops. Though their name might suggest that they were a remnant of the "doo-wop" era, one would be hard pressed to find a more unique and powerful band of the time, and to this day, a number of their songs remain absolutely unmatched in terms of both power and presence. Taking large influences from the worlds of soul and r&b, then fusing them together with a tone and attitude that was unlike anything else being recorded at the time, there are few songs that stand as impressive as The Box Tops' legendary 1971 single, "The Letter." While there is no question that The Box Tops were completely unique in their musical approach, there are a number of moments throughout "The Letter" where the influences on their sound is rather clear, and one cannot help but assume it is an outright tribute when the song kicks off with a stark snare-drum beat, before a brief bass progression. Though many may overlook this segment which only lasts a few seconds, there is no question that it bears a striking similarity to the opening of Roy Orbison's iconic "Pretty Woman," and in the overall tone and style that The Box Tops bring, such influences make perfect sense. Yet it is the rest of the deep groove that bassist Bill Cunningham brings throughout the track which gives "The Letter" its unmistakable mood and presence. However, the rest of the band is in top form, and it is the massive amount of sound that comes forth on the song which made it stand so far apart from the rest of the music of the era. The way that the quick horn bursts manage to punctuate the rhythm is absolutely spectacular, and the way that the string section compliments the swaying guitars of Alex Chilton and Gary Talley is nothing short of musical perfection. The final addition of a somewhat buried, yet strangely bright organ tone from producer Dan Penn completes one of the finest musical structures of all time. However, while one cannot dismiss even a moment of the musical genius that comprises the arrangement on "The Letter," few can argue that the lead vocal from Alex Chilton is anything less than groundbreaking. It is the grit and attitude with which he sings every word that instantly set him miles apart from his peers, and one can hear his influence within a massive number of genres and artists that followed. This rather purposeful gruff and almost angry style that Chilton presents helps to emphasize the amount of soul within the song, and rarely has their been as fantastic a blending of blues, soul, and rock styles in one voice. Furthermore, the fact that Alex Chilton seems to have no trouble working all across the vocal spectrum, letting the overall mood of the sound lead him, pushes "The Letter" to even greater heights, and there is no question that this stands as one of the most iconic vocals ever recorded. Yet it is also the reality that the words which he sings are so universal and perhaps "simple" in some ways that enabled the track to quickly gain an audience, as it topped the charts soon-after being released, and to this day it remains one of the most treasured songs of all time. Whether it is due to these lyrics of longing to which all can relate, or the uniquely mesmerizing vocal style of Chilton, there is no question that "The Letter" stands as one of the few songs that once heard, can never be forgotten. Taking all of this into account, the immediate impact of "The Letter" was clear not only in its success on the sales charts, but in the fact that within a year, a number of other artists had already recorded their own versions of the song. Before the end of 1969, more than a dozen artists had released their own take on "The Letter," with a trio of these managing to become chart hits as well. Yet in the decades that have passed, "The Letter" has become one of the most heavily covered songs in all of music history; with well over two hundred "official" re-recordings of the track. Artists ranging from The Beach Boys to Peter Tosh to Lou Rawls to Al Green among many others putting their own spin on the song, there is simply no arguing what a unique moment in music history is represented within the original release of "The Letter." Furthermore, the reality is that even with so many later takes on their song, the original version from The Box Tops manages to stand far above any other, as there is a raw purity and power found here that is absent elsewhere. While the lineup of The Box Tops would change a number of times over the years, and members of this incarnation would find further success in later bands, there is no question that it was this original grouping that was the most impressive, and one can easily make the case that there is not another song from any point in music history that is quite like The Box Tops monumental 1967 single, "The Letter." November 16: Humble Pie, "Stone Cold Fever"
As the rock and roll scene of the 1970's began to take shape, it seemed that the overall point was to completely forget everything from the previous decade, with most bands taking a far more aggressive and often darker approach to their music. In the place of long, drawn out "jams," bands were going for more direct, distorted sounds, and this would be the building blocks for both heavy metal and punk rock. However, there were still a handful of groups that found many "worthy" aspects of the rock style of the previous generation, and it was within these bands that attempted to blend old and new where one can find some of the finest recordings of the era. Paying close attention to what many might argue is the most important aspect of music, the "groove," and blending it with the more forceful guitar style of the day, there may be no band that better defines the idea of "boogie rock" than the legendary lineup known as Humble Pie. As individuals, one would be hard pressed to find a more musically accomplished group of musicians, and the way that they worked together to form a single sound remains one of the most stunning achievements in all of music history. While the early lineup of the band rarely created a song that was anything less than spectacular, one can argue that the essence of Humble Pie can be found in their phenomenal 1971 song, "Stone Cold Fever." The very moment that "Stone Cold Fever" begins, it is almost misleading in the sound and style that is to come. Instantly assaulting the listener with some of the mot powerful, yet slightly restrained guitar chords in history, it is these opening notes which in many ways define the albums' title, Rock On. The presence and tone on the guitars are not all that surprising, as they are played by none other than Peter Frampton and Steve Marriott. While both of these individuals would go on to make even larger names for themselves in other projects, the fact that they are both present on this track, as well as the way they work with one another, stands as one of the most impressive moments in all of music history. When their sound is "doubled," it takes on a tone that is far larger than almost anything else ever recorded, and yet there is a precision to their playing that gives it persona that is unlike any other guitar piece. However, it is in the middle and closing points of "Stone Cold Fever" where these two guitar gods truly show their talents, as Frampton performs one of the most iconic solos in history. The way that the pair wind around one another is in many ways as good as rock guitar gets, and as they pass the lead back and forth, one cannot help but be completely drawn into the song. The groove that they create has yet to be matched, and there is no question that "Stone Cold Fever" stands as one of the finest moments in the careers of both Frampton and Marriott. However, while there is little auguring against the talent in their guitar section, once one looks at the rest of the band, it is clear that Humble Pie are absolutely worthy of the title "super group." The rhythm section is equally as impressive as the guitarists, with bassist Greg Ridley serving as a perfect compliment to the drumming of Jerry Shirley. In fact, "Stone Cold Fever" is one of the few songs of the era to feature an all-out drum solo in the middle of the song, and it is the fills and grooves that Shirley injects at every angle which makes the song even more captivating. Working his entire drum kit, there is a raw, almost organic sound that comes through in his playing, and it gives "Stone Cold Fever" a sway that is completely unique. It is also the soft-toned, yet deep groove that Ridley lends from beginning to end which defines the idea of "boogie rock," as regardless of ones' musical preference, Humble Pie manages to reach far beyond, drawing in nearly every listener to their smooth, yet heavy rock sound. Along with this fantastic pairing, Marriott fills out the center section of the song with a rather brief, yet amazingly intense harmonica piece, and it is within this inclusion that one can easily draw a connection to the blues sound. The way that all of these instruments come together in such superb balance is a testament to not only the individual talents of each musician, but to their understanding of how to make the sound of the group far superior to the sum of its parts. The fact of the matter is, due to the fact that the musical performances found throughout "Stone Cold Fever" are so intense and flawless, the vocals on the song take a bit of a "back seat" to the rest of the arrangement. This is also because they are rather brief and heavily distorted, and yet one cannot argue that the singing from Steve Marriott does anything less than perfectly match the music over which he sings. It is the grit in his style and the slight distortion placed over his singing which makes it fit as seamlessly as it does, and his singing again draws a strong connection to the blues style, while one can also hear similarities to the likes of Led Zeppelin. Regardless of the influences or where they are in the mix, there is no question that Marriott's vocals are anything less than exceptional, and had they not been in the presence of such an extraordinary musical arrangement, they would have been nothing short of legendary onto themselves. It is the fact that at every angle, Humble Pie are able to achieve such musical excellence that makes them such an important part of music history, and yet once one seems the membership of the band, the obvious selfless acts that can be heard all across their catalog makes their music all the more impressive. While the band boasts one of the most stunning recorded catalogs of all time, few can argue that Humble Pie were at their best on their spectacular 1971 song, "Stone Cold Fever." Daily Guru: "Something Old, Something New #25"
November 15: Brenda Holloway, "Every Little Bit Hurts"
Song: "Every Little Bit Hurts"
Regardless of the specific record label or the genre or even the era during which they existed, there is always some artist or song that seems to stand in contrast to what that specific style built their upon. Whether it is a heavier or faster-paced band recording a ballad, or a label signing and releasing music from a group that sounds unlike anything else in their catalog, few can argue that it is often these anomalies which yield the most memorable and historically significant moments in history. This can certainly be seen when one looks at this history of Motown Records, as they were certainly best known for their upbeat, enthralling numbers, and yet it was one of their more reserved and soulful artists that showed the other side of the label. Bringing an almost gospel influence, along with one of the strongest voices in all of music history, few artists can compare to the sound and presence of Brenda Holloway. Though she was recording what was without question a non-traditional sound for Motown Records at the time, the allure and impact of her mid-1960's singles are undeniable, and to this day, few songs from the era have endured as perfectly as these songs. There are a number of brilliant singes which one can point to as her strongest, but it is hard to argue the lasting impact and overall musical perfection one can hear all across Brenda Holloway's unforgettable 1964 single, "Every Little Bit Hurts." From the very moment that "Every Little Bit Hurts" begins, it is clear that this will not be a "standard" Motown song, as the pace and overall feel are a far cry from the sound for which the label was already known. However, there is a purity and power within the music that cannot be overlooked, and in many ways it is this reality which is the true essence of the "Motown sound." The rhythm of "Every Little Bit Hurts" is rather odd in a number of ways, as it has a pace and a sway which many equate to an almost funeral-eqsue sound, and this fits perfectly with the overall sentiment of the song. This rather unique march is brilliantly complimented by the equally paced piano playing, and it is the interplay between these two sounds which give "Every Little Bit Hurts" a rather somber tone. Yet it is the way that the small string section manages to fill out the remainder of the musical space which enables the track to become so engaging and powerful, and there is no question that along with being a classic of the "Motown era," "Every Little Bit Hurts" also represents one of the finest soul recordings in all of music history. It is also the orchestration found here which shows the wide range and unparalleled talents of the legendary Funk Brothers, as they are able to inject just as much emotion and power into this slower arrangement as one can find on any of their other iconic arrangements. Working in perfect harmony with the fantastic orchestration behind her, there is no arguing that Brenda Holloway's vocal performance on "Every Little Bit Hurts" is not only the finest in her own catalog, but certainly one of the greatest in the entire history of recorded music. Moreso than nearly any other artist from any genre, her singing seems almost effortless, and this is absolutely stunning when one hears the level of power and emotion that comes through on every word. All across the track, Holloway often sounds as if she is on the edge of tears, and it is the pain and torture within her voice that quickly becomes one of the most engaging aspects of the entire song. Furthermore, while other Motown artists where singing of the frustration of love, there is a unique brand of heartbreak that one can hear here, and there is no question that "Every Little Bit Hurts" stands as one of the most direct and universally understood songs to ever approach this subject. The song is also rather unique in comparison to much of the rest of the Motown catalog in that it stands as one of the labels' few "big hits" that was not written by their legendary "Holland-Dozier-Holland"team. Though this track was composed by Ed Cobb, it is the way that Brenda Holloway's voice soars to unmatched heights which makes it a perfect fit, and few singers from any era or style have even come close to such a performance. While there is no question that the 1964 version of "Every Little Bit Hurts" is the definitive take, it was actually the second time that Holloway had recorded the song. In fact, she had recorded the song for another label a few years previously, and was very reluctant to do the song again for Motown Records. However, almost instantly upon its release, this new version of "Every Little Bit Hurts" became a top twenty hit, and it would become one of Holloway's best known songs, as well as one of the most treasured of the entire decade. Strangely enough, "Every Little Bit Hurts" managed to have a musical reach that few other songs in history have attained, as there are cover versions that can be found from a massively wide range of other artists throughout the decades. Since its initial release, artists ranging from George Clinton to The Clash to The Small Faces to Alicia Keys have all taken time to record their own version, and this diversity in tributes is a testament to what a unique song "Every Little Bit Hurts" is in the historical sense. Yet while these later takes are certainly enjoyable and interesting in their own right, there is no question that it is the Motown Records version by Brenda Holloway which stands far above the rest, and the sheer perfection, as well as the rather unique contrast it presented to the rest of the labels' work is what makes her 1964 release of "Every Little Bit Hurts" such an unforgettable moment in music history. November 14: Daily Guru, "Gurucast #98"
November 13: Can, "Oh Yeah"
Daily Guru: "Something Old, Something New #24"
November 10: Archie Shepp, "The Magic Of Ju-Ju"
Daily Guru: "Something Old, Something New #23"
November 8: The Marcels, "Blue Moon"
November 7: Daily Guru, "Gurucast #97"
November 6: The Millennium, "It's You"
November 5: OutKast, "Hey Ya!" Daily Guru: "Something Old, Something New #22"
November 3: Jonathan Richman, "Roadrunner"
November 2: The Shangri-Las, "Leader Of The Pack"
Daily Guru: "Something Old, Something New #21"
November 1: Moby Grape, "Omaha"